Enjoy using the distinctive design style of Quilted Frog in your quilts. 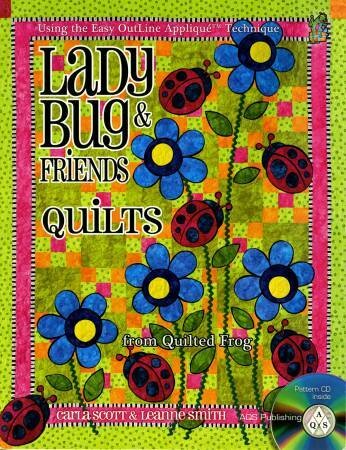 Well-known artists Carla Scott and Leanne Smith have created 24 machine-pieced and appliqued quilt projects suitable for beginners and fun for everyone. Based on bright, graphic designs that appeal to kids of all ages, their loveable ladybugs, adorable ants, and merry monsters work with any new, fresh decor. Use their Easy OutLine Applique® technique to put dramatic black outlines around any raw-edge appliqué. Their super-simple approach makes complex-looking designs a snap to make, and the pattern CD assures perfect results. From pillowcases to quilts, chair covers and pillows to growth charts and aprons, these creative sisters give you lots of ways to bring joy and laughter into your home. Includes CD-Rom.